Sugar ants seem like a summer problem in the Portland Oregon area. In fact, all insects seem like a summer problem, but why do many of us have so many ants crawling around our kitchen? Where were they a few months ago when we would have expected them? To understand why this is, you need to understand a little about their behavior. Sugar ants move when the weather changes. When it gets hot, when it gets cold, when a storm is coming, all of these changes cause colonies to move. Sometimes they move into your house, especially when it is getting cold. So, it should be no surprise that ants suddenly appear when it starts to get a little chilly outside. But you might not really care why you have them, what you really need to know is how you can “not” have them. A customer called us yesterday in distress because her house was covered in sugar ants. We talked for awhile and I was able to pinpoint the reason. She said that they started in the kitchen, so she went out and bought some Ortho Home Defense spray from the store and started spraying them. Within about a week, they came back and they also started showing up in the bathroom. Soon, they popped up in a bedroom and then in the living room. They were spreading! At this point she decided to call us and get some advice. What she did is what a lot of people do. You see a picture of ant on a bottle of ant spray at the store and think that will solve your problems, but it is actually counterproductive! Sugar ants react negatively to repellents and just about everything that you buy at the store is a repellent. Ortho Home Defense for example has an active ingredient of Bifenthrin, which causes panic in the nest when you spray it and sets off a process called “budding” where the colony will split and spread. This is exactly what happened to our customer yesterday. So, what do you do when you have ants? Well, you could obviously call us. But, if you are just looking to do it yourself, be sure not to use anything in a spray bottle or aerosol can because it will probably not work*. If you really want to do it your self, I would recommend only using baits and try reading this article before you start. This will give you the best chance to get rid of them on your own and at the very least, will not make the problem any worse. *On a side note, this is really only the case with sugar ants or “Odorous House Ants”. 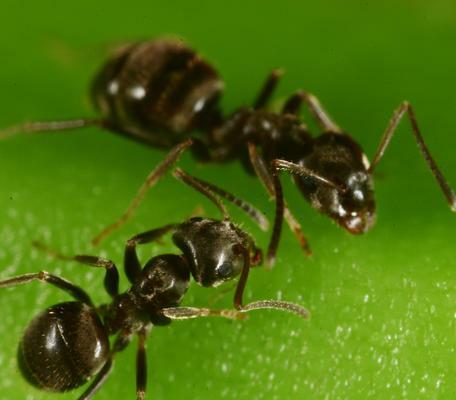 Although these products may not be entirely effective on other ants or insects, they will usually not be counterproductive like they are with sugar ants.